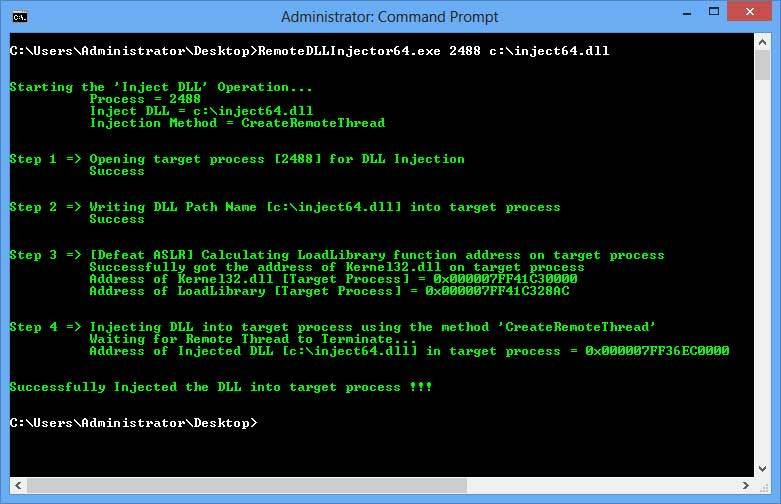 Remote DLL Injector is the free command-line tool to Inject DLL into remote process. Currently it supports DLL injection using the CreateRemoteThread technique. If you are looking for advanced and more user friendly GUI version then check out our popular RemoteDll tool. Being a command-line tool makes it easy to integrate into your automation scripts. Also useful when you are remotely operating on the system especially during Pen Testing situations. One of the unique feature of Remote DLL Injector is its ability Inject DLL into ASLR enabled processes. It dynamically calculates DLL and function offsets within target process before the injection operation. It is fully portable and includes both 32-bit & 64-bit versions. It has been successfully tested on all platforms starting from Windows XP to Windows 8.